Jasmine has worked with a shark conservation charity, on a dolphin research project, and conducted manta, shark, and turtle research in the Maldives. After graduating I undertook a six month internship with a lecturer that really inspired me on my course. I worked as part of a five person team to research and create new module content and an e-book for the environmental science degree course. As a result of this research I’m now writing a paper on the circular economy which I hope will be published! Then, from September until December 2015 I volunteered at Embercombe – a working community in Devon inspiring courageous action towards a more sustainable world. During exams, I lost touch with the reasons why I was doing my degree; Embercombe was a hugely important and necessary re-connection with myself and my goals. At Embercombe I got involved with outdoor learning projects, growing food for the community, learning about communication, gardening, rediscovering my creativity, and so much more. After Christmas this year I began working with Fin Fighters, a new shark conservation charity aiming to make the UK fin free by 2023. I am now their first (volunteer) Shark Fest co-ordinator which has given me the opportunity to communicate with some of my marine idols! 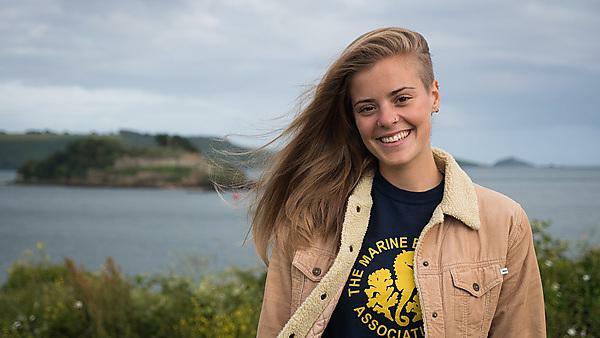 From June until September I have been working at the Marine Biological Association as well as a community outreach trainee, which has involved giving talks at school assembly’s, running MBA stalls and activities at events, joining citizen science projects, and holding public beach sessions throughout the summer holidays. In October I will be moving to a resort in the Maldives for six months to conduct manta, shark, and turtle research and educate tourists about marine biology and conservation. I cannot wait to get back in the water! My environmental science degree has truly given me an interdisciplinary skillset and knowledge: from commercial scuba diving to maritime law, from food production systems to ecological economics, the variety of my course is what drew me to it in the first place – and I wasn’t disappointed. I never thought I would be interested in economics but Lynda Rodwell, my ecological economics lecturer, changed all of that. As a result of a piece of coursework set by Lynda I set up UniCycle (student sustainability projects including food waste collections from campus and clothes swaps) and have discovered a keen interest in the circular economy. This impacts the way I live my life in many ways and our UniCycle projects are now operating at two universities, have won an award, and been featured several times in local newspapers. I’m currently trying to spread the projects to universities across the country! The Shark and Ray Conservation and Research placement that I undertook in the Bahamas was an absolute dream! My first placement in Greece was extremely challenging for me and, whilst I learnt a lot, I didn’t enjoy it at all. The Cape Eleuthera Institute could not have been more different; I had the time of my life surveying in the water every day, hanging out with like-minded people, learning from experts, and teaching students. The placement really solidified my passion for sharks and rays and the type of environment I want to work in. I came back feeling refreshed and raring to go in my final year! Take every opportunity possible to meet and chat to people. Always follow people up who say ‘Oh I have this friend who works… Maybe you could chat with her?’ Offer your time to people or organisations using your specific skillset; work experience and training is invaluable. However, don’t overcommit or stretch yourself too thin. Make proper relationships with people and groups who are relevant to your interests. Stay positive and enthusiastic. Get your name and whatever it is that you do out there. Never feel ashamed to ask for and accept help. And, finally, experience, contacts and passion will get you a long way. The practical training down at the Marine Centre was one of the reasons I chose my degree course. I couldn’t find any other course that included practical, in-water training as well as awesome field trips! Field experience and relevant qualifications really improved my CV. There are so many networks across the city of Plymouth (students and locals) that are doing amazing things. Working with people like the Food Waste Partnership really helped me to retain my momentum and enthusiasm. My university experience really solidified this for me: “Be the change you wish to see.” As corny as it sounds, it’s true! If you want to see something done or something changed, go right ahead and do it. Someone has to! What’s the worst that can happen? The practical experiences that I gained through my degree (qualifications in first aid, power boating, scuba diving, setting up my own volunteer projects, and undertaking placements) have made a significant difference to my CV and has been invaluable working towards my ideal job. The first placement that I went on was with a dolphin research project in Greece, which took on Earthwatch volunteers at the same time as conducting field research. This gave me a real insight into volunteering projects that attract people of all ages and abilities. My job was to collect behavioural and environmental data every five minutes on our daily research trips whilst conducting a team of volunteers on a small boat. I learnt the importance of accuracy in data recording, how to use photo ID, and how to deal with unpredicted emotional situations – at one point, we had to watch and record a young dolphin die whilst its mother tried to save it. Knowing when it’s appropriate to intervene with nature is always a tricky one. Working hours for scientific researchers often revolves around tides, weather, and animal behaviour, so I learnt that getting enough sleep in your schedule is key! My boss on this placement also taught me how critical it is to balance your work with your life; your family, friends, and outside passions. Between second and third year I undertook a placement at the Cape Eleuthera Institute as a Shark and Ray Research and Conservation intern. This was basically my dream job! The application process showed me that perseverance seriously pays off: I followed up my application so many times that I was sure it would be disregarded purely because I was being a pest! It turns out that my enthusiasm for the job only helped my case. I saw first-hand collaborations between scientists and local businesses (fishermen) and the vitality of working to find solutions together, rather than fighting against groups with different interests. I learnt a lot about fieldwork here too, including sampling, handling sharks and rays, tagging, carrying-out wet lab experiments, and data handling. Receiving an award for the UniCycle project that I co-founded with two of my peers. We had a very busy year juggling degree work with volunteering! Passing the projects on to younger students and knowing that the projects would continue after we graduated made the effort all worthwhile. Receiving a volunteering award with some funding for the following years, whilst meeting so many other passionate and inspiring volunteers, really was the cherry on top of an amazing feeling of achievement! Yes, especially environmental science or any of the other marine conservation degree courses. There are such great marine opportunities and facilities for field trips, practical training, and volunteering in Plymouth, as well as a wealth of expertise and first class research. Plus, surfing beaches and Dartmoor are just round the corner!